Always Wanted To Give Your Home That Beautiful Look? Realize That Dream With Style By Hanging This Skillfully Carved Wooden Wall Plaque On The Wall Of Your Drawing Room. Made Of High Quality Wood, This Plaque Comes In A Set Of Three Panels. The Best Part About This Plaque Is That It Is Corrosion Resistive. 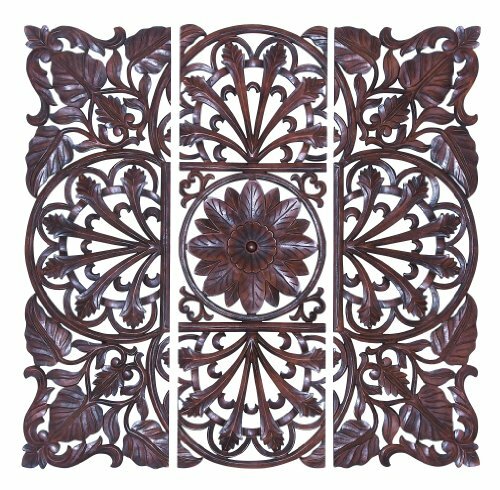 The Design Is Very Elegant And The Entire Plaque Has Been Artistically Carved To Suit Your Needs. It Has A Unique Finish And Is Highly Polished In Brown Earth Tone. It Has Lotus Like Carvings At The Center And Leaves At The Corner Which Balances The Design Beautifully. The Gloss And Shine Of The Plaque Will Be Hard To Miss And Will Definitely Attract Attention Of Your Guests. With The Right Amount Of Light, It Will Make Your Living Room Walls Stand Out Like Never Before. So Go Ahead And Give Your Hall The Aesthetic Look It Deserves.